Wedding costs add up fast but these are some things we did to save money on our wedding. Look around for a seamstress. Almost everyone needs their dress altered in some way and that can be pricey. 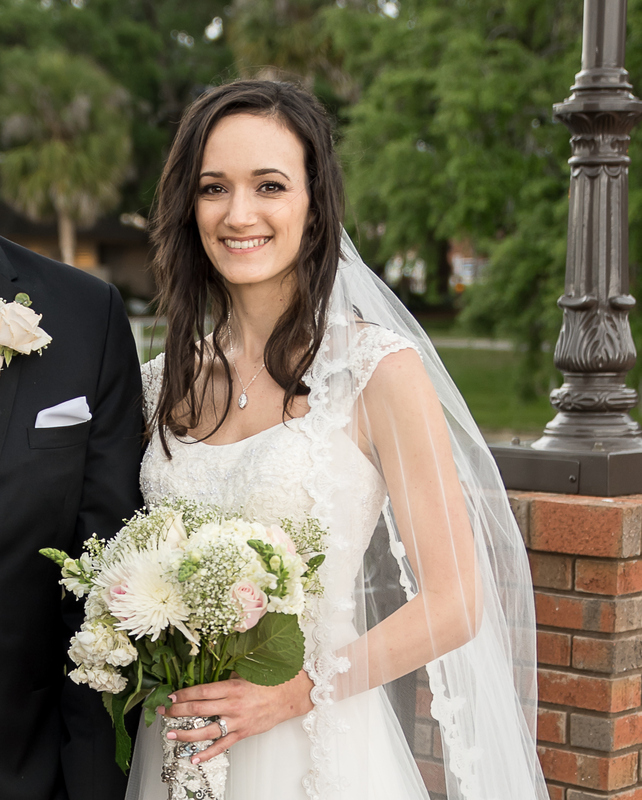 My dress was from David’s Bridal who offers alterations but I ended up going to a seamstress near me that was able to add straps, a sash, the bustle and alterations for a good price. I found the jewel sash and lace straps from a local fabric store. Make your own bouquets, boutonnieres and center pieces. Making your own bouquets and center pieces is not only fun and easy but can save you money. I needed 10 bridesmaids bouquets, my bouquet, 11 boutonnieres and flower center pieces. To save even more we used the bridesmaids bouquets for the center pieces at the reception. There are lots of tutorials on how to make bouquets on Pinterest. Buy your wedding cake from a grocery store. I don’t remember the exact price for a cake from the baker who worked with our caterer but I believe it was somewhere around $4 and up a slice depending on what you wanted. We had a large wedding list and so $4 a slice added up fast. I’m not sure about all grocery store cakes but Publix has some delicious cakes and so many different fillings. We ordered a 3 tier cake and then had sheet cake in the kitchen so there was enough for everyone. No one knew about the sheet cake, it all looked and tasted the same cut into pieces. They also delivered the cake to the venue and our day of wedding coordinator put the flowers and topper on. It turned out exactly how I wanted! Click here for the tutorial for DIY bridesmaids hangers. Let’s be real DIY doesn’t always mean you’ll save money, supplies can add up fast and then you might realize you could have bought it for the same price or cheaper and saved time BUT if you have most of the supplies on hand or the supplies are inexpensive it can help you save. I made each of my bridesmaids hangers for their dresses, this cost me almost nothing since I already had the hangers. My mom made our guestbook, I love how it turned out! Click here for DIY guestbook post. I made my invitations but Etsy has tons of print yourself wedding invitations. Buy a nice card stock paper and print from your home. Get married on a Friday. Having your wedding on a Friday isn’t always convenient for everyone but a lot of venues have a discounted price for Friday rentals. And who doesn’t love an excuse for a day off or half day of work or school. Find a caterer that lets you supply your alcohol. Our caterer let us supply the alcohol. We bought what we wanted and dropped it off to them a couple days before and they brought it all to the venue. We only had beer and wine. Make your own deserts for the desert table. This one can be hard with all of the last minute wedding details adding baking isn’t always realistic but if you have someone who loves to bake or do a girls night with your bridesmaids and bake some treats it can help you save. My aunt loves to bake and offered to make the treats. She also did the one at my bridal shower which you can see here. I hope these money saving tips can help you with your wedding budget. Enjoy this time with your fiance and try not to stress out with your to do list. I find it cool that you shared how you got your wedding cake and sheet cake from a grocer with toppings on so that you can save more for the occasion. In my opinion, one way to spend the savings wisely is to hire a private DJ for the reception party. Doing this will help the guests enjoy the evening and celebrate the union of two families.